Tim Slone, director of the information and education division of the Kentucky Department of Fish and Wildlife Resources, admires a rabbit he harvested last winter in Henry County. 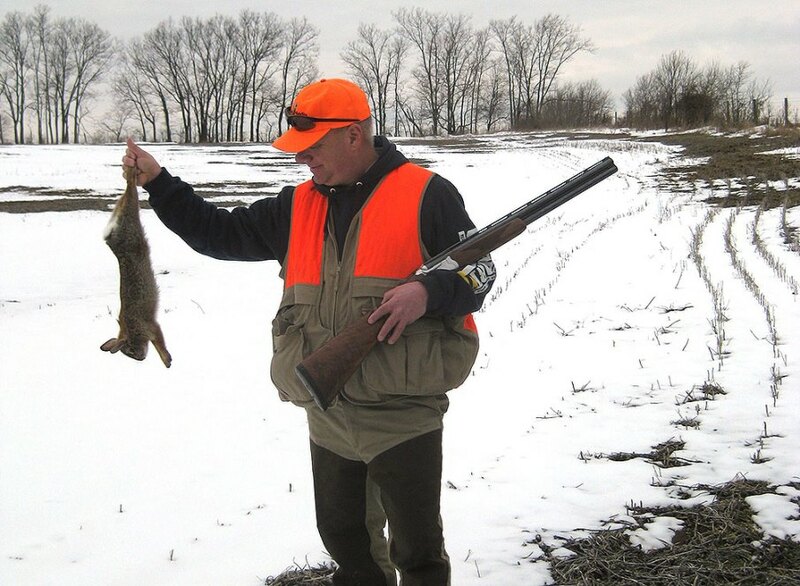 Winter's cold and snow make great conditions for rabbit hunting. Outdoors enthusiasts of a certain age well remember their grandfathers extolling the virtues of fried rabbit, declaring it superior to filet mignon and better than any restaurant meal you could buy. Many hunters scratch around for something to get them afield during that dull period from Christmas until the first warm winds of spring. Grab a shotgun, don some brush pants, a hunter orange vest and walk an overgrown fencerow to jump a rabbit. Cedar thickets make excellent rabbit hunting spots on cold, windy days or when snow blankets the ground. Thick stands of young cedar offer a windbreak as well as hiding cover. Make sure to stop and wait periodically when hunting cedar thickets. “Being still makes them nervous and they will flush,” Robinson said. The Bluegrass Region and the mountains of eastern Kentucky hold the highest rabbit densities, but practically any wildlife management area in Kentucky offers decent rabbit hunting. Shotshells loaded with No. 6 shot make an excellent rabbit load. Most rabbit shots are fairly close when hunting without dogs in winter. An improved cylinder choke works fine. When hunting with dogs, a modified choke is a good choice. Don’t over-choke your shotgun and damage the tasty rabbit meat. Rabbit season closes Jan. 31 in the Eastern Zone. The season closes Feb. 10 in all counties west of and including Hancock, Ohio, Butler, Warren and Allen. The daily bag limit is four rabbits. Robinson asks rabbit hunters to participate in the Hunter Cooperator Survey and fill out a hunting log. This log provides valuable population information to biologists so they can make more informed decisions regarding rabbit management. Participants receive a small gift and a copy of the annual survey. Hunters can find printable hunting logs on the Kentucky Fish and Wildlife website at fw.ky.gov. Click on the “Hunt” tab, then the “Game Species” tab.